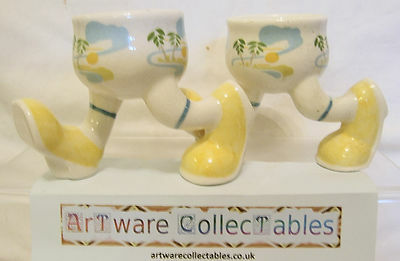 This is a great opportunity to acquire an additional piece from this very popular set of Caribbean (or Tropical) Walking Ware products manufactured by Carlton Ware. Designed by Roger Michell (Lustre Pottery) for Carlton Ware, these particular pieces are relatively 'hard-to-find' at the moment. This item is an Eggcup in the RSJ style. This offer is for ONE Eggcup (though I do have two available). Each Eggcup has the usual evocative scene set in the Caribbean with Palm Trees and a golden sun scrolling around the entire bowl section. As with all these items it has yellow shoes with a blue line denoting the socks. There is no crazing and there are no chips/nibbles nor restoration work. The underside of the bowl is backstamped with also Lustre Pottery 1980.